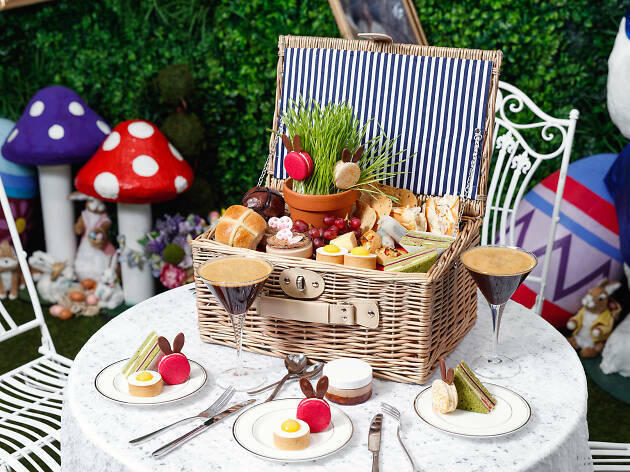 A fantastical Easter garden will pop-up in Shangri-La Sydney's Lobby Lounge throughout April with executive pastry chef Anna Polyviou. And what could be better than to fill said garden with delightful treats and heavenly cocktails? If you have always wanted to savour Polyviou’s signature desserts, Easter Garden High Tea will feature her cracked egg tart, indulgent chocolate pots, sticky hot cross buns and an elevated version of the old-school soft serve in a waffle cone. Accompanying these morsels, you’ll be able to drink a popcorn caramel Martini or a Spritz. Flutes of Chandon and Veuve Clicquot will also be on offer if you prefer bubbles. This special afternoon out costs from $75 per person or $55 for kids. If you’re looking for a more grown-up affair, experience the Cocktails in the Garden. Starting from $55 per person, you’ll be handed a picnic basket full of savoury bites, as well as a Belvedere Spritz, a flute of Chandon or a popcorn caramel Martini. Inside the basket, there will be cured meats, Australian cheeses, olives, fluffy quiches and fruit to accompany your refreshing cocktail. Want something a little fancier? For $85 per couple, there’s the option to drink a flute of Veuve Clicquot or Chandon. If you’re going all out, $115 shared between two will keep the cocktails or sparkling free-flowing for 90 minutes. 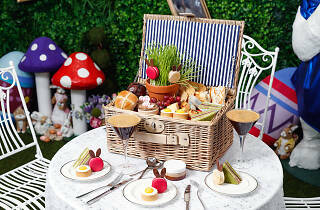 Easter Garden High Tea is available in three sessions throughout the day starting at 11am, 1pm and 3.15pm from April 1 to April 29, and cocktails in the garden run nightly from March 29 to April 29. To book and for more information head to the Shangri-La website.